Based on new observations and improved modeling techniques, we have re-analyzed seven Cepheids in the Large Magellanic Cloud. 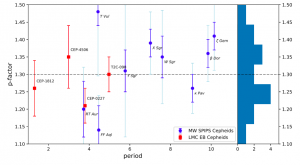 Improved physical parameters have been determined for the exotic system OGLE-LMC-CEP-1718 composed of two first-overtone Cepheids and a completely new model was obtained for the OGLE-LMC-CEP-1812 classical Cepheid. This is now the shortest period Cepheid for which the projection factor is measured. The typical accuracy of our dynamical masses and radii determinations is 1%. Period-radius diagram. The FO Cepheids (blue) of our study lie between the canonical (C) and non-canonical (NC) theoretical P-R relations, but are more consistent with the latter. The F-mode (red) Cepheids are consistent with the empirical relation. Color areas mark the theoretical relations with the rotation included for stars crossing the instability strip for the third time. For the FO pulsators their positions for corresponding fundamental mode periods (PF ) are shown in grey. Radii of several Galactic Cepheids in this period range are also shown for comparison. The radii of the six classical Cepheids follow period-radius relations in the literature. Our very accurate physical parameter measurements allow us to calculate a purely empirical, tight period-mass-radius relation which agrees well with theoretical relations derived from non-canonical models. This empirical relation is a powerful tool to calculate accurate masses for single Cepheids for which precise radii can be obtained from Baade-Wesselink-type analyses. The mass of the Type-II Cepheid κ Pav, 0.56 ± 0.08 M☉, determined using this relation is in a very good agreement with theoretical predictions. Period – p-factor diagram. No correlation is seen neither for our eclipsing binary LMC Cepheids, nor for the Galactic ones. 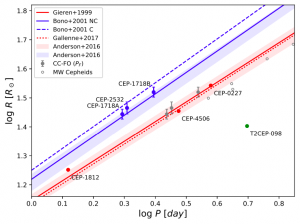 For MW Cepheids, the total uncertainty is shown in a lighter blue color, while the statistical part is marked with a darker one. A histogram for all p-factor values is shown on the right. We find large differences between the p-factor values derived for the Cepheids in our sample. Evidence is presented that a simple period–p-factor relation shows an intrinsic dispersion, hinting at the relevance of other parameters, such as the masses, radii and radial velocity variation amplitudes. We also find evidence that the systematic blueshift exhibited by Cepheids, is primarily correlated with their gravity. The companion star of the Cepheid in the OGLE-LMC-CEP-4506 system has a very similar temperature and luminosity and is clearly located inside the Cepheid instability strip, yet it is not pulsating.